Victor was born in Italy before moving to Argentina at age six. Ten years later Calabrese relocated to the U.S. and attended Platt Tech in Meriden. He played soccer at Middlesex Community College in 1971. He moved on to play professional soccer in the American Soccer League (ASL) for the Connecticut Wildcats, Connecticut Yankees, New York Apollos, and Cleveland Cobras. He was the top scorer for the Yankees for 2 years and was a top scorer in the ASL in 1976. Calabrese also played for various top soccer teams in the Connecticut Soccer League, including Meriden Silver, Vasco da Gama (Bridgeport), Middletown Garibaldi, Middletown Sons of Italy, Bridgeport Italians, and New Haven Italians. 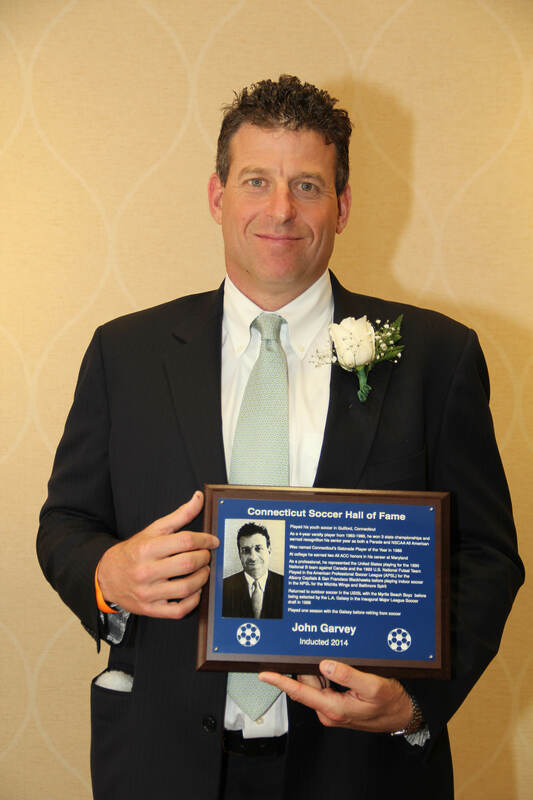 He finished his playing career twelve years ago at age 50 with Waterbury Ponte Soccer Club. 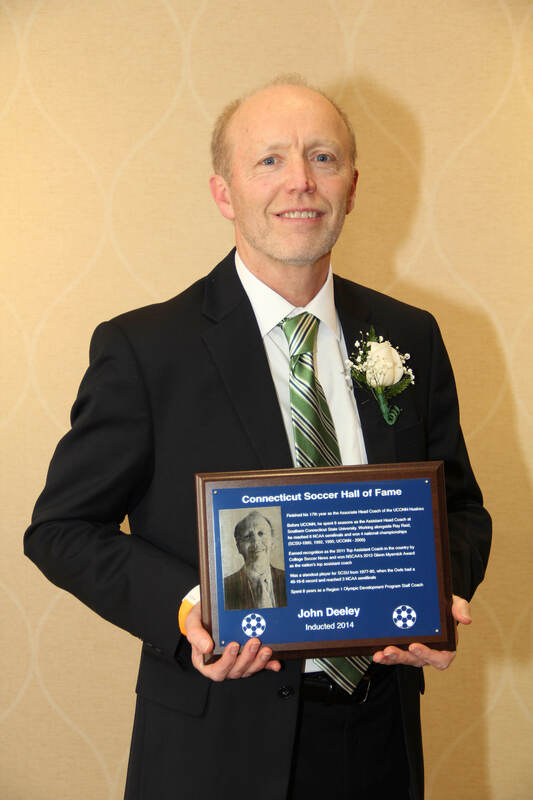 John Deeley just finished his 17th year as the Associate Head Coach of the UConn Huskies. Before UConn, Deeley spent 8 seasons as the Assistant Head Coach at Southern Connecticut State University. Working alongside Ray Reid, Deeley reached 8 NCAA semifinals and won 4 national championships (SCSU-1990, 1992, 1995; UConn - 2000). Deeley earned recognition as the 2011 Top Assistant Coach in the country by College Soccer News and won NSCAA’s 2013 Glenn Myernick Award as the nation’s top assistant coach.. He was a standout player for SCSU from 1977-80, when the Owls had a 48-16-6 record and reached 3 NCAA semifinals. He also spent 8 years as a Region 1 Olympic Development Program Staff Coach. John played his youth soccer in Guilford, Connecticut, before attending the University of Maryland. As a 4-year varsity player from 1983-1986, he won 3 state championships and earned recognition his senior year as both a Parade and NSCAA All American. He was named Connecticut’s Gatorade Player of the Year in 1986. He earned two All ACC honors in his career at Maryland through 1990. As a professional, John represented the United States playing for the 1990 National B team against Canada and the 1992 U.S. National Futsal Team. He played in the American Professional Soccer League (APSL) for the Albany Capitals (1991 – lost in title game), San Francisco Blackhawks (1992 – CONCACAF Semifinalists) before playing indoor soccer. Garvey played in the National Professional Soccer League (NPSL – indoor soccer) for the Wichita Wings (1994) and Baltimore Spirit (1995). He returned to outdoor soccer with a short stint in the USISL with the Myrtle Beach Boyz (1995) before being selected by the L.A. Galaxy in the inaugural Major League Soccer draft in 1996. Garvey played one season with the Galaxy before retiring from soccer. 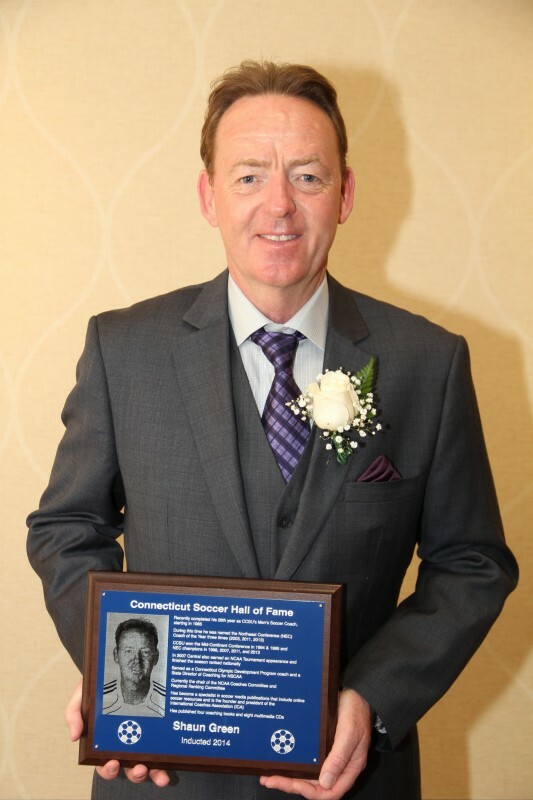 Shaun recently completed his 29th year as CCSU’s Mens Soccer Coach, starting in 1985. During this time he was named the Northeast Conference (NEC) Coach of the Year three times (2003, 2011, 2013). CCSU won the Mid-Continent Conference in 1994 & 1995 and NEC champions in 1998, 2007, 2011, and 2013. In 2007 Central also earned an NCAA Tournament appearance and finished the season ranked nationally. Green has served as a Connecticut Olympic Development Program coach and a state Director of Coaching for NSCAA. He is formerly the chair of the NEC Coaches Committee and Regional Ranking Committee. Green has become a specialist in soccer media publications that include online soccer resources and is the founder and president of the International Coaches Association (ICA). He has published four coaching books and eight multimedia CDs. 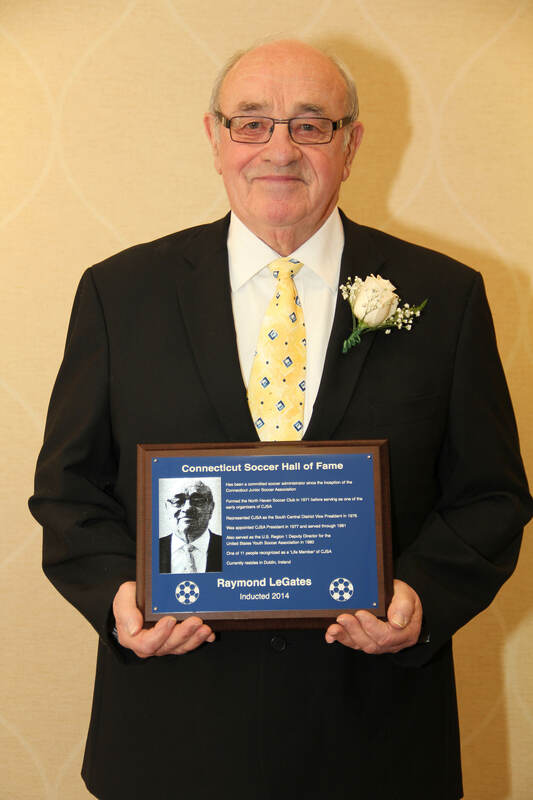 Ray LeGates has been a committed soccer administrator since the inception of the Connecticut Junior Soccer Association. 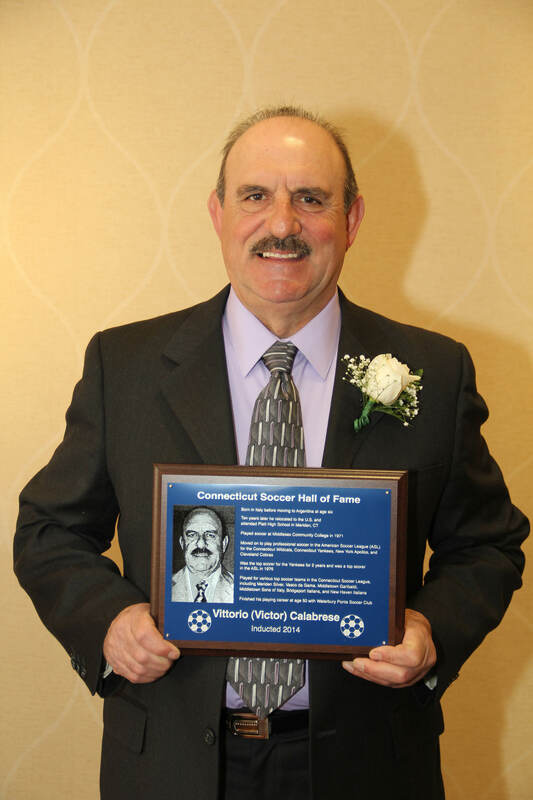 He formed the North Haven Soccer Club in 1971 before serving as one of the early organizers of CJSA. LeGates represented CJSA as the South Central District Vice President in 1976. He was appointed CJSA President in 1977 and served through1981. LeGates also served as the U.S. Region 1 Administrator for the United States Youth Soccer Association from 1977-80. He is one of 11 people recognized as a ‘Life Member’ of CJSA. He currently resides in Dublin, Ireland. McEachen began his playing career at Conard High School in 1961 & ‘62. He attended Mitchell Community College and won the National Championship in 1964 and lost the title game in 1965. He was an All-Regional selection both years at Mitchell. He became a First Team All American at West Virginia University (1967). Ron entered the Army and served as Assistant Soccer Coach at West Point. He played on the NY Cosmos reserve team while serving in the military (1970 and 1971). He played professionally in the ASL for the CT Wildcats (1974), Pittsburgh Miners (1975), Miami Toros (1976), and Rhode Island Oceaneers (1978). McEachen also played for the Italian American Stars of the CT Soccer League and was a player/coach for Hartford Hellenic in the 1970s. He moved to Vermont to coach at Middlebury College, University of Vermont, and Skidmore College before retiring in 2012 with over 300 victories. During this time he was a USSF National Staff coach (1981-92), an assistant coach with the New England Revolution of MLS (1996), NSCAA National Staff Coach (1982-present), and the NSCAA Associate Director of Coaching (1997). Ken Pearson has been a standout player in Connecticut at all levels for the past 40 years. He played soccer at Torrington HS from 1976-78, scored 30 goals in 15 games as a senior and was their first All State player in 1978. At Central Connecticut State University (1979-83) Pearson is the career scoring leader with 67 goals and 24 assists. He was a 3-time All New England (1981, 82, & 83) and 2-time All American (1981 & 83). Pearson earned the Frederick M. Gladstone Award as the top senior athlete at CCSU and was inducted into their Athletic Hall of Fame in 1995. Success followed Pearson as he was a dominant striker for the Hartford Portuguese (CT Soccer League Champion & State Cup winner), New Britain Polonia-Falcons (CT Soccer League Champion & State Cup winner), & Ludlow Lusitano (LASA League). He was the top goal scorer in the CSL in 1990 and 1991 with Derby SC. As an over 30 player, his teams have won multiple state and league titles. Pearson also was the Assistant Coach at CCSU in 1985 and Torrington HS in 1984. 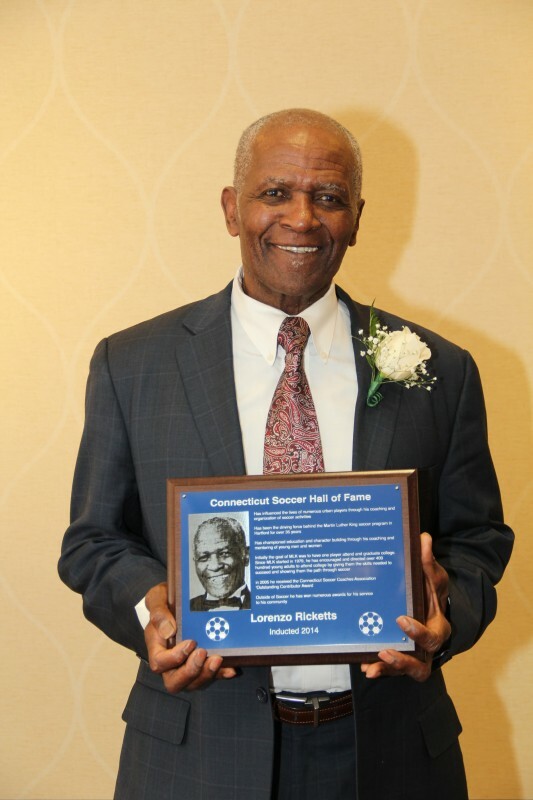 Lorenzo Ricketts has single handedly influenced the lives of numerous urban players through his coaching and organization of soccer activities. 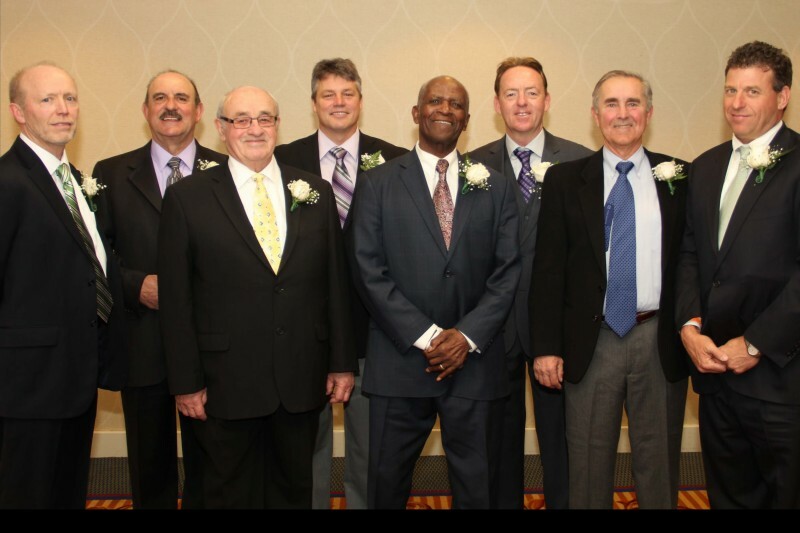 He has been the driving force behind the Martin Luther King soccer program in Hartford for over 35 years. Ricketts has championed education and character building through his coaching and mentoring of young men and women. Initially the goal of MLK was to have one player attend and graduate college. Since MLK started in 1979, Ricketts and MLK have encouraged and directed over 400 hundred young adults to attend college by giving them the skills needed to succeed and showing them the path through soccer. Ricketts also received the 2005 Connecticut Soccer Coaches Association ‘Outstanding Contributor Award’.